United Airlines is showing flights from Toronto to Ulan Bator, Mongolia for $794 CAD roundtrip including taxes. The flights have 2 stops each way, in Washington, D.C. and Beijing, China. 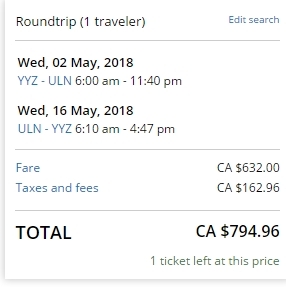 This is a highly unusual price drop, about 47% below the typical best roundtrip prices from Toronto to Mongolia. - look for the dates that are $789 roundtrip. 7 Responses to "Toronto to Ulan Bator, Mongolia - $794 CAD roundtrip including taxes"
"I really want to go to Mongolia" said almost nobody ever in history. Haha, yeah, although every now and then I see an adventurous soul asking about Mongolia. It's just one of those places you never see a great deal to. Had to post it, if only for posterity. I really want to go to Mongolia! And I'm not just saying that. Thanks for posting! So do I! Eric sounds ignorant as hell. I just bought this, CAD $832.66 round trip, April 29-May 30th, two long daytime layovers in Seoul (10 hrs and 6 hrs), two 3-hour layovers in Chicago, 30 days in Mongolia, includes a checked bag, long hauls are with Asiana (more spacious seats). Wow! 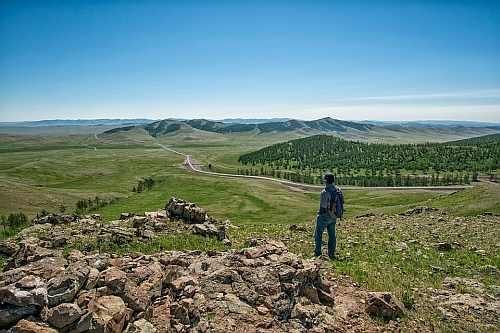 Is this your first time visiting Mongolia? . I really wanted to take advantage of this opportunity to Mongolia but unfortunately the dates didn't align with ability to take time off from work! Please keep letting us know about deals to more off the beaten paths!! Thanks!